It isn’t easy being the leader of anything. William Shakespeare knew it, and so do corporate CEOs. And there’s one time when being in charge is even more trying than usual: during a crisis. General Motors is in the middle of a serious crisis right now. The ongoing scandal regarding faulty ignition switches has resulted in multiple rounds of congressional testimony, a lengthy internal report detailing just how badly the company screwed up, a compensation fund that could cost the company between $400 million and $600 million, and a fine from the Department of Transportation and the National Highway Traffic Safety administration of $35 million. An unconfirmed but widely speculated probe by the Department of Justice could yet result in criminal charges or a large fine. GM has already admitted that its mistakes led directly to the deaths of 13 people, and more could be coming. 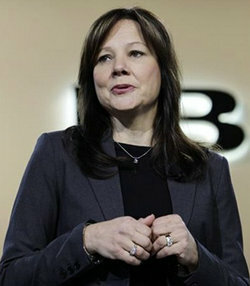 And through it all, CEO Mary Barra has come out looking better than anyone could have expected. During her congressional testimony last month, Senators heaped praise on Barra seemingly every time they spoke. So why has Barra managed to escape the ire that so many have for her company, and that so many other leaders of companies in crisis have faced? Mostly, it seems to be because she has portrayed herself as truly contrite, and as honest as possible, from the start, rather than showing any sort of scorn or hiding in the shadows and not speaking to the press and the public. “GM is not only following best practices, they’re also effectively writing a new book by setting higher industry standards for future recalls by automakers,” said Philip Elwood, a vice-president at crisis management firm Levick. Barra has been at the center of all of these actions. They weren’t handed off to other executives. They weren’t announced in press releases on a Friday afternoon. Barra got on stage in front of the press and the public and explained exactly how she believes the company failed, and what it was going to do to get better. Her actions never seemed fake, and it was difficult to say she wasn’t legitimately upset that the automaker she has worked at for several decades allowed this to happen. Compare that to one of the other big public relations crises of the past decade: the 2010 BP Deepwater Horizon Oil Spill. Then-CEO Tony Hayward started by minimizing the incident, saying it wasn’t a big deal. Of course, his most famous gaffe was saying to a reporter that he would like his “life back.” Hayward was massively criticized, and was out of the company within a matter of months. Elwood also said that the popularity Barra had before the crisis hit has probably helped her. The crisis at GM is far from over. But if Barra keeps playing her cards the way she has so far, she could be held up for years as a textbook example of how a CEO should handle a potentially fatal crisis.